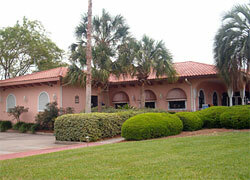 The Orange Blossom Hills Clubhouse sits on one of the highest elevations in the Villages. Amenities include a full service restaurant, golf shop and priority pool. The restaurant offers a diverse menu and features daily specials. While dining or having a relaxing cocktail, enjoy your favorite sporting event on one of the numerous televisions in the lounge area. Our Golf Shop is stocked with the latest in equipment and apparel for every golfer's needs along with gift items and accessories for the recreational shopper. The famous Orange Blossom Hills priority pool features a beautiful waterfall and spa. All this and a scenic elevated view of the Hill Top Executive golf course.